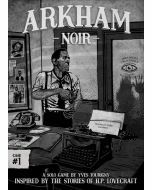 Arkham Noir is a solitaire card game inspired by the interconnected stories of H. P. Lovecraft and other authors, re-imagined as noir detective stories. Each case stands alone. In Case #2 – Called Forth By Thunder, as private investigator Howard Lovecraft, you will investigate events based on the stories: "The Lurking Fear" (1923) and "The Diary of Alonzo Typer" (1938).